Okay, so here’s the scoop . . .
Rusty drives up to our campsite and I can tell by his expression that his visit to the VA was disappointing. “I’m not getting a house in May. It could be two or three months,” he announces. In short, HUD wants more paperwork. Wow! What a surprise! When Rusty tells the man handing him a stack of forms that he is unable to fill out paperwork due to the shaking of his hands, the man tells Rusty to come back next Monday. At that time someone will go through the many forms with Rusty and fill them out for him. Rusty also has to provide hard copies of his bank statements. Not to mention burn gas in his truck every time he has to make a trip into Prescott. Now Rusty has to rely on his boondocking skills in order to wait. This waiting period means staying in Arizona in his truck, possibly through the hot summer months with no air conditioning. He points to some mountains where he can camp above 8,000 feet. It has been a stressful day for Rusty. I understand this. Years ago I accompanied both my father and later my uncle on several visits to the VA in Georgia for various reasons. Just seeing and talking with fellow vets stirs up all sorts of feelings. And that’s before dealing with government entities such as HUD. Rusty tells me he has a headache and his legs ache from walking up and down flights of stairs. The news of the explosions at the Boston marathon doesn’t help. I suggest he set up his camp and lie down for a while. Rusty doesn’t camp next to us. He can’t get a strong enough signal for phone and internet here, so he moves to a spot along the ridge that has a clear line from the tower. It’s close enough that the crew and I can walk over for a visit. The house-warming gifts will need to be postponed. I’m sorry I ignited so much excitement only to douse it with news that we have to wait. I hope you’ll stay with my blog for the special day when I can announce that Rusty and Timber have the address for their new home! It’s very windy today and a cold front is moving in. Not the kind of day to take photographs. I did manage to snap this one . . . This entry was posted in Simple living and tagged Arizona, boondocking, HUD, Prescott, simple living, Southwest, VA, veterans. Bookmark the permalink. 3 Responses to Okay, so here’s the scoop . . .
Having been associated with the military for over 30 years, I was expecting some sort of glitch in Rusty’s attempts to get a home. I’m sad that it’s not going to happen as soon as we all thought, but at least he’s still “on the list.” I’m saying prayers that everything works out for him eventually and that he won’t have to wait too long. Thanks for keeping us updated, Sue. 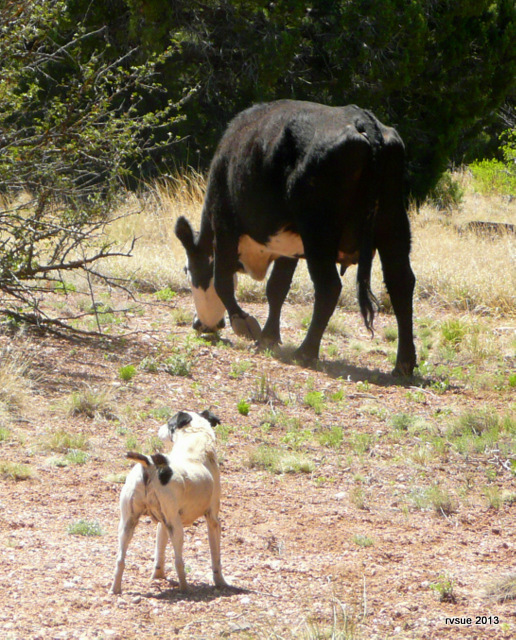 Love the photo of Spike “protecting” you against the big bad cow! I’ve been catching up older posts since somehow being ejected from the blog subscriber list 🙂 We will be putting our 5th wheel in Williams, AZ for the summer at Railside RV Park. If Rusty still doesn’t have a place by end of May let me know. Hubby and I will do whatever we can to help him out. Thank you, Karin. That’s very kind of you and your husband. It looks like he will have his place soon. I don’t know what the deal is with people being ejected from my list. I hate that!